It’s imperative for IU East’s mission and continued growth that instructors teach and students learn in more innovative ways. Having Chancellor Kathryn Cruz-Uribe as a strong believer certainly helps. She is an active advocate for interactive learning. “She talks about flipping the classroom and getting engaged with students in creative ways,” says Tim Scales, senior lecturer and director of the Center for Entrepreneurship. “She believes you have to be innovative (and) if you are stagnant, you are going nowhere,” Scales said. 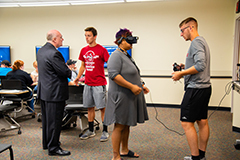 There’s no clearer way to see innovation on display at IU East than the interactive classroom created by merging Rooms 203 and 211 in Springwood Hall. Classes in business, nursing, economics and technology have all been taught there. He uses a collaborative approach instead of the traditional style of stand-up-front lecturing. He said his classes have been averaging 84 students. They all are invited to come in early to tap into the classroom’s technology — and some even show up an hour and a half before class. They can connect their media to the room’s technology, explore virtual reality or even play video games, Scales says. Shelly Burns also found that to be true by co-teaching a core nursing class last semester. She and Macy Bennett quickly saw the possibilities for reaching students through collaboration and active learning. “We wanted to get students out of their seats,” says Burns, clinical assistant professor in the School of Nursing and Health Services. The combined room also allows instructors to use computer technology that young students have grown up using. Tim Scales, senior lecturer, uses different teaching techniques in the interactive classroom. Scales uses different technologies as part of his instruction for courses in economics and business. Appropriately, the room has been named the Kathryn and Eugene Cruz-Uribe Interactive Classroom following their $50,000 gift to the Student Events and Activities Center. The Cruz-Uribes supported the center and philanthropic initiatives on campus before joining IU East. While visiting campus as a candidate for chancellor in January 2013, the Cruz-Uribes heard about the plans for the SEC, which were well underway. They were excited about the project and the possibilities it would bring to IU East, so they contributed to the “Save My Seat” campaign. Their support continued by providing a $50,000 gift toward the SEC. Later, the Cruz-Uribe’s made a $100,000 gift to campus to establish the Gloria & Joseph Allwarden and Lillian & Antonio Cruz-Uribe Scholarship fund to benefit IU East students. 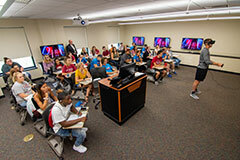 To recognize their generosity, the campus named the interactive classroom that Scales, Burns and others are using so effectively, the Chancellor Kathryn Cruz-Uribe and Eugene Cruz-Uribe Interactive Classroom. A plaque honors the Cruz-Uribes in the interactive classroom. Eugene worked as a professor of history before retiring from IU East in 2017. He tragically died on March 12, 2018 following a bicycling accident. That’s so appropriate, says Scales, because of their impact at IU East. 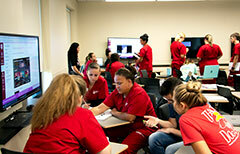 Nursing students use the interactive classroom to view medical videos and discuss the cases as a group. The interactive classroom is set up to be used for traditional classroom settings, group discussions or one-on-one learning. Scales said he often visits with other educators on campus to discuss creative ideas that could reach across other fields of study. Of course, the interactive classroom doesn’t have applications for all fields of study. Faculty who use the interactive classroom implement best practices – an official mission for the university – within the classroom. She believes her co-teaching experience in the interactive classroom led to a deeper and richer learning for students. But, change doesn’t come easily at first. They both were teaching the same class to 25 students. It made sense to combine efforts, to teach 50 students together. 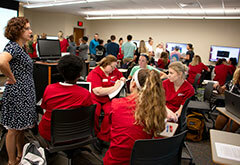 Macy Bennett, lecturer of nursing, discusses the video project with nursing students. They are collaborating again this fall in a core nursing class. One thing they quickly found last semester was that the stations allowed all students to see a lesson or a PowerPoint in a more personal way. “We started to investigate what we could do to make a richer learning experience,” Burns says. Students could focus on different learning experiences, while the instructors could interact in more personal ways as they visited the stations. For example, students at each station could focus on a different process of working with a patient. Burns and Bennett led a tour of the combined classroom for other nursing faculty. They used the programs as if they were students to get an idea of how active learning works.